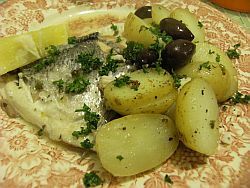 I got my Sea Bream at Kish Fish near Smithfield Square, a great city centre fresh fish shop that I am truly delighted to live so close to. In conversation on twitter today, Catherine @backpedalling told me about the weekly draw they’re currently running at Kish Fish. Every time you buy something, you can enter your name in a draw. Every Saturday, a name is picked, and that person gets €50 worth of Kish Fish to take home. WANT! I was distracted by the size of the lovely Bream that I picked up, and so, alas, I’ll have to get there again next week to enter myself in the draw. 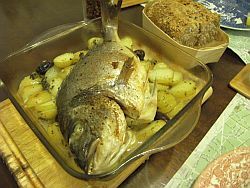 I used Barney Desmazery Whole Roast Bream With Potatoes & Olives recipe over on BBC Good Food. 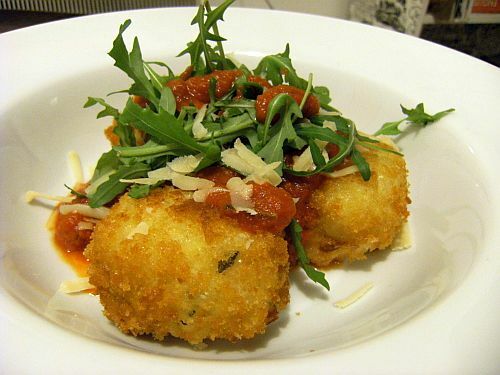 It was totally awesome, very easy and completely delicious. 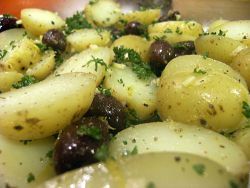 I used Kalamata olives, which are technically purple rather than black, but mannnn, they were amazing in this. I used curly parsley and it was perfect. What is the difference between curly and flat leaf parsley? On the site, it suggests serving with spinach, and although this would be lovely, it was totally a meal in itself, with the added bonus of only having three items to wash-up. This means a lot to me. Hate cleaning up. Of any kind. I’ve realsed that I really like a lot of Barney Desmazery’s recipes on BGF – they’re usually for totally unpretentious and simple food, my total favourite. Have a look through them for yourself! 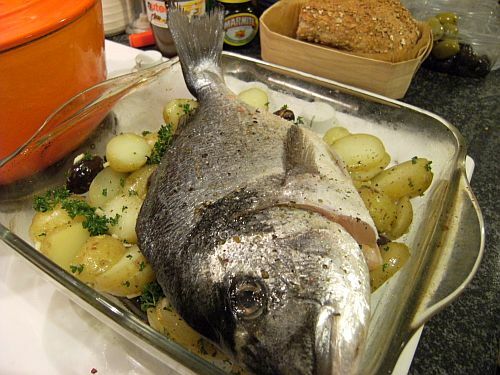 Uncooked fish on partially cooked potatoes. That fish does not look happy. I feel like I’m cheating at food blogging linking to other sites but, for realz, I’m not at the stage to be making up recipes, and if I shared some of my own creations, this would not bode well for your tums, seriously. I mentioned we went out to a gig after dinner tonight. Twas to Yeasayer in The Academy and it were brill! Follow the link to their track O.N.E. on Hype Machine. COOKIE and PASTRY FAILS - not safe for human consumption. 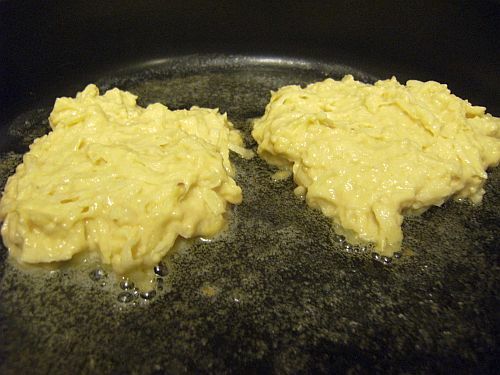 It has indeed been a pleasure to share my food fails of the last year with you all. Although this particular tale begins with a food fail, it thankfully ends in a food win, with a little help from my friends. 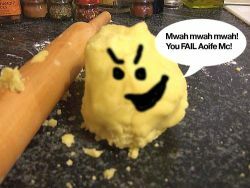 Well, with the help of The Dublin Cookery School, that is. 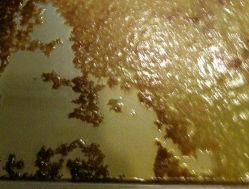 Before Christmas, I attempted to make some cookies, as a little treat for friends and c0-workers. Alas, as you can see from the above photo, this was not to be. 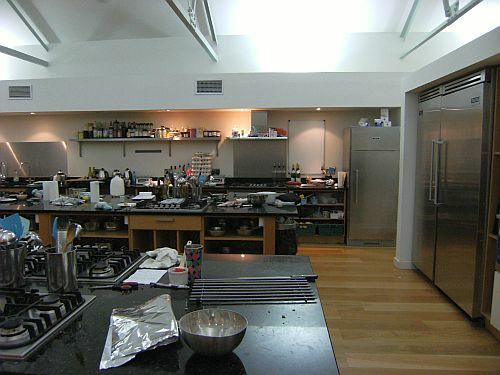 It was on the presentation of this squalid tray of molten cookie mixture that Niall had the perfect idea for a Christmas present – a one day Baking Course at The Dublin Cookery School with Lynda Booth. Thanks to The Daily Spud for the recommendation! Off I trotted last Saturday, filled with the trepidation that anyone who’s ever failed at baking knows all too well. There was no need to fear. My baking demons were to be well and truly conquered. Now. This could turn out to be much like a trip to the hairdressers. You know the way you can never get your hair to bounce like it did as you left the salon? Perhaps my cakes won’t have quite the same bounce when I attempt to make them without the watchful eye of Lynda and her two helpers. Throughout the course of the day, myself and the 25 or so other baking students worked through a series of recipes, some of which we ate at Little Break, some of which we munched at lunch, and the rest we got to take home and stuff our faces in private. Oh, yeahhhh. The whole process worked with Lynda making everything before we did in her presentation kitchen, giving us tips and answering our baking fear-related questions. Then we were led with our recipe booklet in hand to work in pairs in the beautiful naturally lit hands-on kitchen space, where Lynda’s assistants had already weighed out all of the ingredients, for us to just put together. Wish I had someone to do that for me every day, let me tell you. They baby-sat our baking goods while they cooked, making sure that they all turned out perfectly, with not a Bake Fail in sight. Here are a few pics of what we made throughout the day. 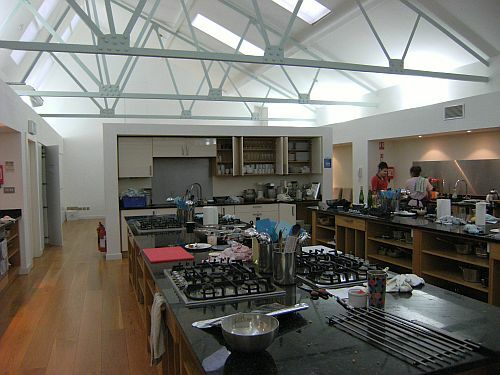 I would thoroughly recommend a course at The Dublin Cookery School, for yourself or as a present for the foodie in your life. 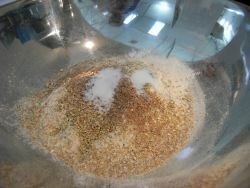 A fantastic way to spend a day, and it has left me with a quiet confidence that, one day soon, I will bake. Oh yes, I will bake! 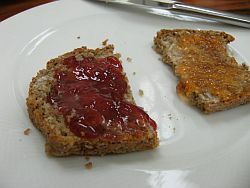 We started off with Brown Bread, which we sat down to eat with delicious jam for our Elevenses. If you’re reading in Dublin (or close enough) come down to The Twisted Pepper on Middle Abbey Street this Thursday 4th of February. 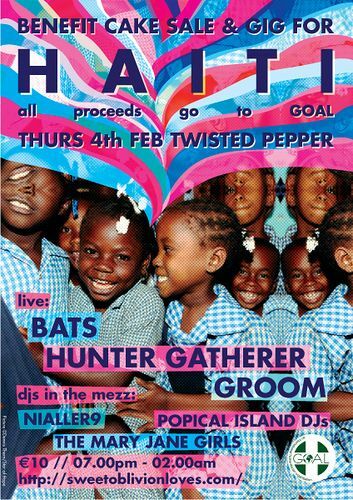 Sweet Oblivion is hosting a Bake Sale and Gig, with all proceeds going to GOAL Haiti Earthquake Appeal. Alongside a host of other bakers, I’ll be providing some of the cakes and cookies and muffins and fudge slices and an array of other delicious baked goods to be on sale on the night as part of the fundraising initiative. It’s 10 euro in, starts at 7pm and will run through til 2am. See you there – and bring your sweet tooth! Man, I just love Sundays. A perfectly lazy day can be made even better with a ludicrously delicious brunch and a copy of The Observer Food Monthly. I’m so happy right now. In Alex James’ column in OFM, he mentions Kate Moss’ mantra “Nothing tastes as good as thin feels.” Having once been rather slender (and infinitely hungrier) I can sort of understand where she’s coming from. However, this fleeting feeling of sisterhood with the famous waif evaporates once I remember that her comment is inherently wrong, if not completely mental. What the hell is she talking about? She has clearly never eaten Arancini, gobbled a Monte Christo sambo or made her own Hollandaise Sauce. Of course, it’s lovely to fit perfectly into all your clothes and to never have to hide bumpy bulges behind flowing tops. However, I’m of the opinion that the satisfaction of feeling slim can in no way compare to the feeling you get when something you’ve cooked has made you and your partner/friends really, really happy. But, of course, it’s all about balance. Obviously, you don’t want to be eating Egg’s Benedict every other day, as it’s full of artery-clogging-heart-bashing butter. But one should allow oneself to enjoy it once in a while, without thinking of the consequences to one’s backside. 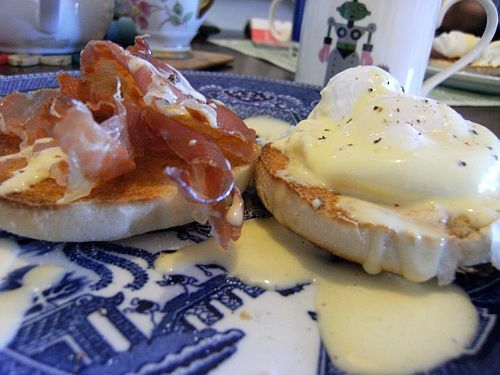 Anyway, I made my own Hollandaise Sauce this morning to make my Egg’s Benedict complete, using Antony Worrall Thompson’s Cheat’s recipe. It has a lottttttt of butter in it. But what the hell, you only live once. I’d prefer to be content and plump than thin and miserable, any day. So take THAT Kate Moss. Heh heh. Okay, that’s it. This is the last year I’m making New Year’s Resolutions. It’s been nearly 20 days since I made a pledge to myself to lose some food-blog-pounds by eating deliciously healthy winter salads and going to the gym at least 4 times a week. Suffice to say, the closest I’ve been to the gym is when I walked past it on my way to a PUB, for flip’s sake. Bah! I wouldn’t mind, only the slim person inside my food-blog-padded belly is starting to feel a bit depressed. Seriously, I have three baggy outfits on rotation at the moment, because none of my clothes fit me any more. 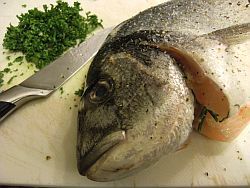 But you know what, fish for breakfast/brunch is decidedly delicious. 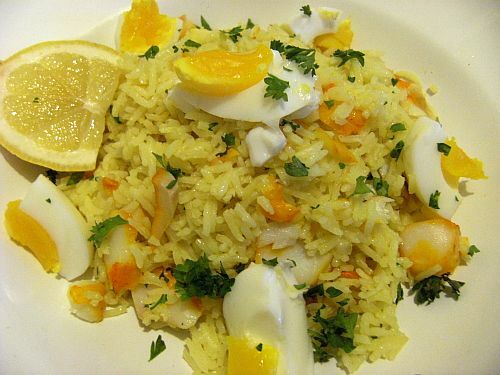 I whipped up this Kedgeree by Rick Stein which I found over on, yes, that’s right the BBC Good Food website. I’ve decided to ban myself from using the site for a whole week, as I think I should try broadening my recipe source horizons. And also because @ivanvarian on twitter accused me of working on commission, hah! I wish. I’d eat my way through the whole site, I tells ya. 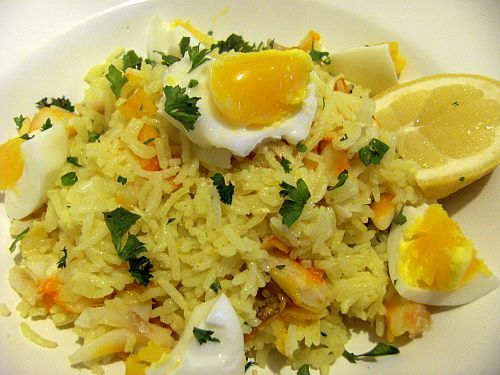 Kedgeree has such an interesting history which (for me anyway as I am strange) enhances the flavour. It’s a dish that apparently originated in Scotland, but emigrated to India via the soldiers of The Great Brrritish Empire, and was embraced by the Indians themselves. It then made the journey back home to the UK with the soldiers, and became a popular brunch option. It’s an unexpectedly light meal, but also has enough substance to sooth a sore head on a Sunday. Perfect. I followed the Rick Stein recipe on BBC Good Food and it worked out perfectly. I made it for two so I halved the ingredients. 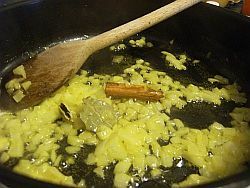 I didn’t halve the 1/4 teaspoon amount of turmeric in the original recipe, and even then it wasn’t really enough. The rice didn’t take on much of a colour, which was the only thing I was disappointed by. 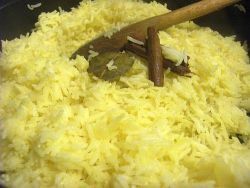 The method Rick Stein outlined for cooking the rice was fantastic, leaving me with deliciously fluffy and moist rice. 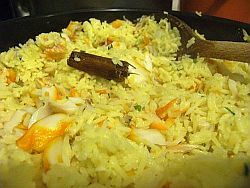 I’ll definitely be using this the next time I cook rice, with or without the rest of the Kedgeree. Yum, yum, in my tum. 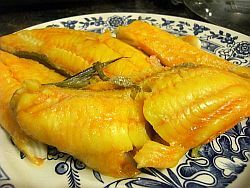 Ooh, look at that lovely smoked haddock. Beautiful. I’ve been posting so many links to BBC Good Food of late that I felt I really ought to broaden my internet-recipe-source-horizons. It’s just that the BBC is so reliable and wonderful, it really is the first place I look for inspiration. Not moving too far out of my recipe-comfort-zone, I was recommended by @vparody to check out this Jamie Oliver Beef Stew recipe. I’m so glad I did. It was totally amazing, and again, delicious warmed up the next day for lunch. I followed the recipe exactly and it made enough for 4 generous portions. 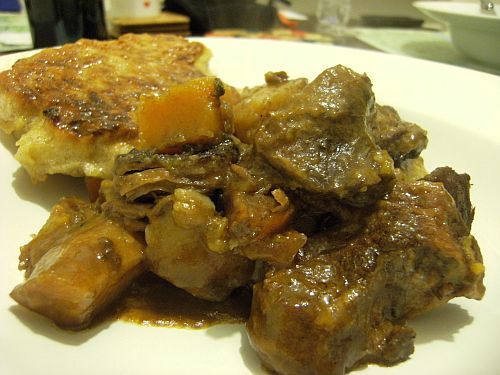 Head over here for Jool’s Favourite Beef Stew by Jamie Oliver. I followed it pretty much to the T, but I left out the potatoes because I was going to serve it with the Boxty. Thought that could prevent a potato-overload-carb-coma. Although Jamie recommends Beef Skirt (which my FX Buckley butcher informed me was a muscle part of the beef) I ended up using some Shoulder Stewing Beef. After four hours in the oven at a low heat, it literally fell apart, so tender it was. Delicious. I also used Look and Taste’s neat website to make Boxty. I went for the Donegal Boxty and they were yum! Definitely give them a go. Here’s the link for the recipe as well as a very useful instruction video. Although the pic doesn’t really do it justice at all – here is the lovely stew! Honestly, if you look really closely, you’ll see there is, in fact, a falafel in there…ahem. 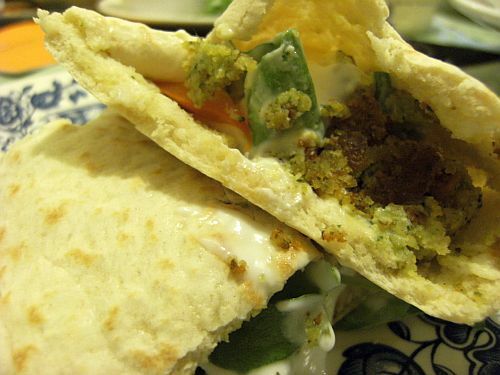 Well, a Falafel Half-Fail at any rate. I love Falafels so much that I would love to be able to make them at home. When I lived in Saudi Arabia, we bought Falafels and Shwarmas as treats on Wednesday nights (Wednesday being the start of the weekend). The crispiness as well as the delicious herby flavour of the chickpea pockets of goodness is a taste that I’ve never forgotten. During the week, I tried my own Falafels and had a bit of a fail. Have a look after the jump to see where I went wrong. I’d really appreciate all your falafel knowledge and tips! 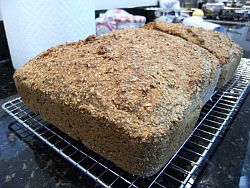 Oh, I may as well rename the blog “I Can Has Testing BBC Good Food Recipes” as the next few posts will most probably feature a link to the On-Line Recipe Bible. Niall’s Mum made us some Irish Stew over the Christmas holidays, and it was so delicious, that we’ve both been craving another bowl of it since. Being snowed in over the weekend gave me an excuse to see if I could come close to replicating the yumminess in a bowl. 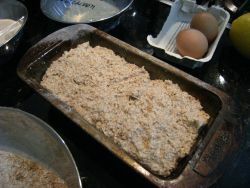 I decided on this recipe on BBC Good Food. I headed to FX Buckley on Moore Street and picked up some lamb neck fillets for only a few euro, and nearly got all the way home without falling on my backside. Nearly. Still, it wasn’t quite as bad a fall as this guy’s. 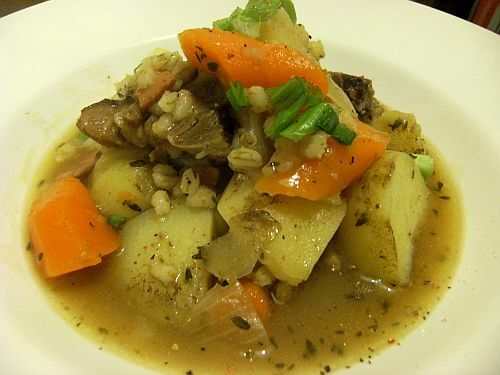 I used this BBC Good Food Irish Stew recipe. Do it, and do it good. I cut this recipe by a third, more or less, which made four portions. So instead of using 900g of meat, I used 600g, and so on and so forth. The maths was quite difficult for me, but I made it through. We had it for dinner on Friday night, and it warmed our bones, begorrah. But, be warned, it was even tastier reheated the next day for lunch. I had never used Pearl Barley before and it was a revelation. They’re like thick, savoury rice crispies and they added another comfort level to the stew. I found them in Tesco’s so they appear to be readily available.